The Golden Eagle is one of the most magnificent birds we have in San Diego County. To see a Golden Eagle flying is a rare and lucky sighting as eagles avoid human activity. However, they are an important species in San Diego County and one we want to protect and conserve. The Golden eagle has the largest territory needs and the lowest population density of any bird in San Diego County. Pairs remain in their territories year-round and, though the young disperse widely, they generally will try to come back and nest near where they were born. Most pairs nest on cliffs and the rest in trees on steep slopes and they hunt in nearby grasslands, sage scrub, or chaparral. The hunting areas are known as the eagles’ ‘territory’ and is an essential part of its survival. Pairs generally rotate from year to year among several nesting sites in their territories. That a specific nest site is not used for a few years, does not mean it is non-functional or not important. Eagles can live over 35 years in the wild and they mate for life. Golden eagle are big! They have 7,000 feathers and can weigh up to 10 pounds with wing spans over 7 feet. They can reach flying speeds of 120 mph. In San Diego, their primary food source are rabbits. They are a protected species and we are lucky to have them in our County. We are losing Eagle territories at an alarming rate. Human activities lead to nest/territory abandonment by Golden Eagles. Several types of human disturbance affect eagles, especially rock climbing on nesting cliffs, but also shooting (recreational and military), human trail use too close to sensitive eagle areas, and agriculture (avocado orchards planted near nest sites). Electrocution on power lines is also a source of direct mortality: 37 of 55 dead eagles found between 1988-2003 had been electrocuted. Scavenging prey killed by lead shot or rodenticides, wind turbines, and drought are also factors suppressing eagle populations. Human activity of any kind on trails and areas too close to golden eagle areas can cause nests to fail and birds to abandon their territory. Golden eagle have very high nest site fidelity and birds generally want to nest near where they were born. This means if a nesting area is lost we may lose not only that pair but also its off-spring that we would normally expect to return to nest nearby in the future. There is increasing pressure to open areas near sensitive eagle sites to increased trail and human activities. These could contribute to the loss of existing territories and future generations of eagles. Nest territories slated to be ‘conserved’ under MSCP have been lost, so more needs to be done to protect those remaining. The Multiple Species Conservation Plan (MSCP) was a regional habitat planning effort intended to conserve contiguous lands and the most sensitive and important areas for key species, like the Golden Eagle. As part of the MSCP, seven eagle nests and territories were supposed to be ‘conserved’. Four were allowed to be lost (taken) to accommodate development in the region (Sloane, El Cajon mountain, San Vincente, Fosters). 20 years later, three territories have been lost- two of them in the ‘to be conserved’ category (Del Dios, San Miguel). This means as a region we are left with only 11 nesting pairs of Golden Eagles in the MSCP boundaries and we must do everything we can to keep them viable. Many of us are concerned that, in spite of efforts to day, we need to do more to arrest the loss of nesting and Golden eagle territories in our County. Whether you are a hiker, trail runner, climber, biker, birder, educator, equestrian, target-shooter, or hunter, we all have a part to play and there are many protective actions we can take to help. If we work together we will be able to keep our eagles flying in San Diego. Breeding season is NOW when the Eagles are most sensitive. Breeding schedule for Golden Eagles is generally as follows. Nest building begins after the first heavy rainfall. This means conservation actions are most important between December and May. The nests must be left-alone, protected, and human and domestic animal activity avoid areas the Eagles are using. Learn more about this amazing bird at San Diego Zoo Golden Eagle and Visit Tonka at the Safari Park to see a Golden Eagle up close. How to tell a Golden Eagle from a Red-Tailed Hawk. Join Respect the Eagle to educate others about protecting our county’s Golden Eagles. Several actions need to be taken to protect our remaining nesting pairs and territories. Develop a conservation plan, based on biology, for each territory to protect remaining birds. Evaluate possibility of restoring activities to abandoned ‘conserved’ nest sites. Withdraw or deny requests to increase trail activity in sensitive areas of nests. Post Respect the Eagle signs with information. Never use poison baits or rodenticides in areas where eagles, owls, or hawks may be hunting. It is better for your health too. Write County Supervisors and California Department of Fish and Wildlife to request the immediate development of a conservation plan for eagle territories. 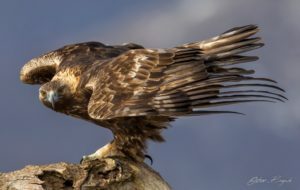 Contact your County Supervisor and urge them to re-evaluate, re-design, and/or re-locate proposed development near Otay Mountain and Jamul in light of Golden eagle losses.